I sat in the conference room with my arms folded and one brow cocked. Last week, I was in Southern California to listen to the founders of VaultChain make their pitch. Through the giant windows of the conference room, I had a perfect view of a well-manicured golf course overlooking the Pacific Ocean. Despite my skepticism, I figured a trip to California in January was at least worth its while. The pitch was that VaultChain is a disruptor. It will change the way we trade and hold precious metals — namely gold. It harnesses the power of blockchain technology for efficient and secure trading. Civilizations have always recognized the value of gold. But trading gold hasn’t caught up to the modern world. There are few options when it comes to investing in the yellow metal. The original way to hold gold is to own it in its physical form. But buying it can mean paying a 3% to 5% premium. If you don’t own your own personal safe, the cost to carry can range from 0.3% to 1%, annually. Fees erode gold’s timeless value. The next alternative, which first appeared in the early 2000s, is the exchange-traded funds (ETFs) and trusts that hold precious metals. The first ETF on the scene was SPDR Gold Shares (NYSE: GLD) in 2004. The annual expense is between 0.2% and 0.6%, after a nominal broker fee. While cheaper than holding physical gold, most of these options are not redeemable for the physical metal. The founders of VaultChain pitched a brand-new way to hold gold. VaultChain is backed by the Royal Canadian Mint (RCM). With billions of dollars’ worth of gold stored at its facilities, the RCM is a stable and secure depository for gold. The RCM formed the VaultChain platform. Now producers, refiners and dealers all trade on the same platform. The everyday retail investor is trading gold on the same platform as giants like Goldcorp and Agnico Eagle Mines. What separates VaultChain from other alternatives is that the ownership records are kept on a blockchain. This is the same technology that drove the cryptocurrency craze, thanks to its security and anonymity. VaultChain is not a cryptocurrency. Blockchain allows investors to move their gold through any number of dealers on the platform. They can even go to the RCM to redeem their gold. Expenses for trading and storing gold are modest. There is a 1% transaction fee, and the annual carrying fee is 0.12%. Below is a chart from Tradewind, the creator of VaultChain, with the estimated five-year cost of ownership. 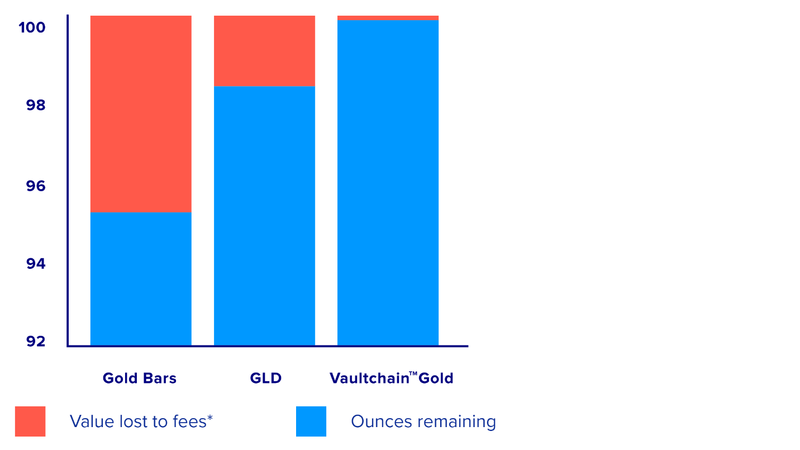 That makes VaultChain an especially affordable option for long-term holders of gold. Buying gold has finally caught up with the 21st century. Hold the physical metal — and pay high fees. Or gain exposure through ETFs — but with limited to no access to the gold. Gold is able to hold strong during a market sell-off like we saw in December. Now is the perfect time to add gold to your portfolio. You’ll partake in the subsequent rally that we’re in now. Consider contacting a dealer like Sprott Inc. about adding VaultChain Gold to your precious metals portfolio.